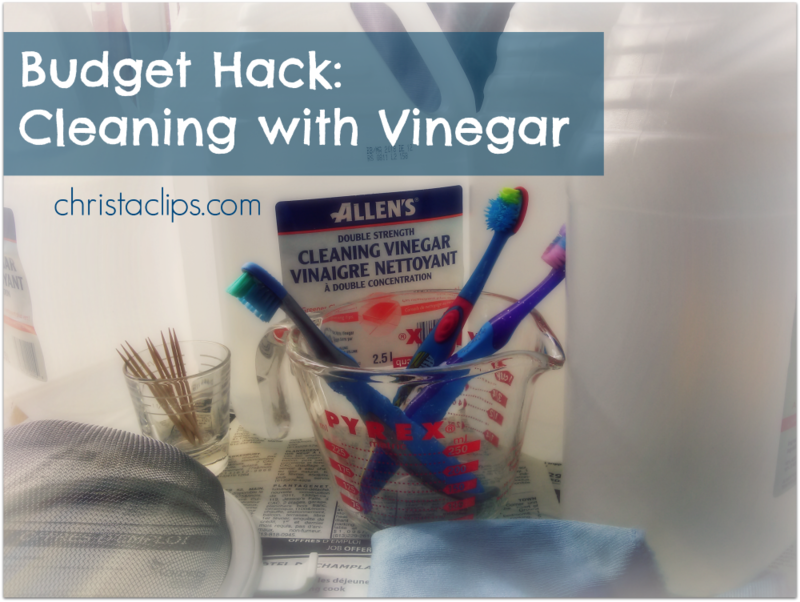 Christa Clips shares her top 5 ways to use vinegar as a greener cleaner! Buying it in a stronger solution is even softer on the budget! We’ve all heard the praises for vinegar as a greener, cheaper DIY household cleaning solution, but did you know that you can buy a double concentrated vinegar especially for cleaning? Cleaning with vinegar is soft on the budget to begin with, finding double strength on sale for the same price as the usual distilled white vinegar was enough to tempt me into buying 5 bottles – enough to last me through spring cleaning and beyond! 1. Grout. Re-purpose an old toothbrush and scrub away days (weeks? months? years – oh my!) from dark and discoloured grout on tiled floors and surfaces. It’s amazing how seemingly permanent stains on grout can be lifted with full strength vinegar. Note: Vinegar and marble do not mix! 2. Sticky Dust. You know, the type of dust that accumulates on low traffic surfaces and is actually goopy enough to shred a paper towel if you tried to wipe it off dry? (If you’ve never had sticky dust in your house, I’m not entirely certain we can be friends!) Common culprits are above the fridge, plant shelves & ledges above kitchen cabinets, horizontal blinds, the top of door & window frames, and (the WORST offender) the top of ceiling fan blades. I use a damp cloth with straight up vinegar to cut through the sticky dust! 4. Hardwood Floor Grooves. I use plain steam on our hardwood floors, but every now and then I need to attack the grooves under the dining room table with a toothpick and vinegar! The vinegar/water solution (50/50) really loosens food and dirt that have hardened in the cracks. 5. Bathtub Jets. Perhaps because we don’t use our bathtub jets very often, they get filled with slime and mould really quickly. Once a month (and especially on the eve before house guests arrive!) I fill the tub to the level of the jets with hot water and pour in a full jug of vinegar. (Even with a full jug, this is still a fraction of the cost that store bought bathtub jet cleaners cost and is MUCH better for the environment). Run the jets for as long as needed until nothing but clear water is circulating in the tub – ours usually takes about 10 minutes. Tip: I bought a wire kitchen strainer from the dollar store and use it to scoop out anything that has been loosened by the vinegar. When I’m finished cleaning the jets, I scoop out several pitchers of the vinegar/water mixture and pour it down the washroom sink and shower drains. If you’re patient enough to let the water cool down completely, you can add a few pitchers to the toilet bowl, as well. Note: never pour anything hot into the toilet as it can melt the wax seal and you’ll have a whole different clean-up job to worry about! For more suggestions about how to clean with vinegar including laundry, gardening, automotive, and pet cleaning, visit the Vinegar Tips website. (Yes, there’s a vinegar tips website!) and check out Common Cents Mom’s Spring Cleaning Pinterest Board … it’s chock-a-block full of other DIY cleaning solutions and inspiration! What’s your favourite way to clean with vinegar? Drop a line in the comments below! *The sale price was $1.99 for 2.5 litres of the double concentrated vinegar at Food Basics. Posted on March 4, 2014, in Budget Hacks, Christa Clips and tagged Budget Hack, Christa Clips, DIY cleaning solutions, Green Cleaning. Bookmark the permalink. 4 Comments. Christa, I never knew there was such a thing as extra strength vinegar! And though I knew vinegar was good for cleaning, I didn’t know it was good for what you call “sticky dust.” So good to know! so we can be friends, then, Janet?! that I have truly loved browsing your weblog posts.